BCB is a community full of people who are highly engaged with politics. Many of us take classes on theoretical or practical aspects of the public sphere, many of us want to pursue politics-related careers, one civic engagement initiative comes after the other, and our cafeteria gives place to countless post-Socratic dialogues on the ideal state. However, I have always been curious as to what would happen if politics started to interfere with our lives on a more personal level — if it affected our lives as a community directly. 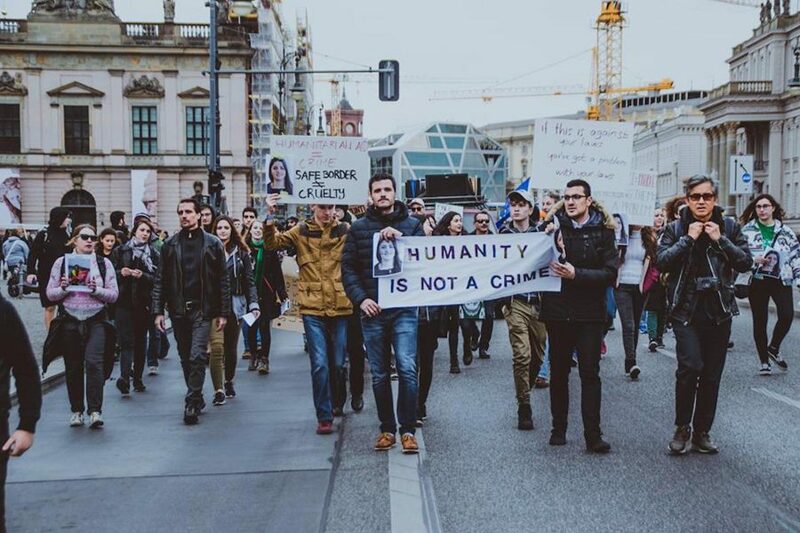 During the final days of summer break this hypothetical question became tragically relevant: as everyone knows by now, one of our classmates, Sara Mardini, didn’t arrive back in Berlin to start the semester with us after being arrested on unfounded charges, and to this day she awaits justice in prison. Details of the case are addressed elsewhere on this blog. The injustice of being imprisoned for humanitarian work was clear to everyone, as were the political implications of her arrest: the “refugee crisis” has for years been considered primarily a political issue and not a humanitarian one. That is why everyone in the community had their own way of relating to the issue — as a moral or political one. For a couple of days, you couldn’t scroll through your social media feed without running into tons of solidarity messages and expressions of helplessness, anger, disillusionment. The Bard community was genuinely frustrated by the injustice. But was there a way to channel this frustration into effective action? And was there enough willingness and commitment to do so? A handful of fellow students and I decided to find out, trying to mobilize as many Bardians as possible. However, those who were closest to Sara did not necessarily want to take the lead: to them, the whole issue was much more personal than political. They had their own, personal ways of addressing their friend’s situation and understandably did not seek my or anyone’s help in doing so. On the other hand, people who didn’t have any special relation to Sara or had only come to BCB this semester became active. The motivations were numerous: some wanted to show moral support or found it important to stand together as a college community, others saw this as an opportunity to speak out against systemic racism and oppression. Questions, offers of help and expressions of support coming from unknown Bard email addresses started to fill my mailbox, and some started to recognize me as “the guy who keeps writing mass emails about Sara”. That was true: invitations to discussions, demonstration-sign workshops, video projects, the designing of posters and such activities were largely sent out by the same handful of people, including myself. At one point, the association of my name with Sara’s situation started to feel problematic. I never wanted to appropriate Sara’s cause or to become the go-to person for it, and neither did Jessie Kao, Elena Gagovska, or any of the most visibly involved students. I kept having to clarify that I have no special background information and felt confused when some people, though certainly not a majority, seemed to expect us to tell them what they should do. Of course, every cause eventually starts to have a few “faces” attached to it; this time I could see from inside how this process happens, how the administration and the community started to perceive certain students as initiators and not others, and how chance, experience and willingness rather than personal closeness to the particular case determined who would represent the case to the student body and represent the college on public platforms, such as the Rescue the Rescuers demonstration or the “Unteilbar” rally. Some might very well say that it’s natural for the most confident and ambitious to come forward, or that, as a community, we need to let the most articulate and politically versed represent our stance in order to communicate it effectively to the public. Others might emphasize the inclusion of diverse voices, especially voices of those most affected personally, in speaking out against the injustice in order to encourage the less experienced or confident to shape the discourse and to avoid their marginalization. Whether we have been able to find the right balance between all these aspects in representing Sara’s case yet — I can’t decide. What I’m sure about, though, is that every instance of injustice is an opportunity to practice civic engagement, become politically active, and gain experience with mobilization — and there’s nothing wrong with utilizing these opportunities as long as our primary focus remains on the case itself. I, too, learned a lot about what motivates people and what doesn’t. I experienced how much more effective approaching people personally is than any campaigning tool. I saw how complicated it is to speak to the whole community in the absence of a space where the whole community regularly meets. And I experienced how difficult it is to keep ourselves motivated when it seems that there is actually little we can do to directly change the situation. As soon, however, as something concrete — a demonstration — started to materialize, with a specified if not too ambitious goal of having a few hundred people participate, willingness to engage increased dramatically. As soon as we were able to say, “hey, do you wanna help us with pushing a van, drawing a leaflet, distributing flyers, carrying signs, help people get there…?” we started to somehow sound a lot more persuasive than “hey, do you wanna… uh… sit down with us and figure something out?” Previously, the task was so unspecific that it was perhaps unrealistic to expect people to engage with it amid all their academic and other duties. But once clear, demarcated tasks and goals were set, people were able to channel their energy productively. That’s what made BCB’s participation in the Rescue the Rescuers demonstration a positive experience: people left the event in good spirits, two members of our community gave successful public speeches, and the organizers and college administration saw that their efforts to reach a good turnout had resonated with the student body. Overall, everyone felt we had done a good job and had the right to be satisfied. But Sara’s imprisonment is not just a matter of us having a “positive experience” or doing a “good job”: it’s an actual person in an actual prison. And as the wave of attention is over with the demo, she’s still in prison and might remain there for many months to come. Therefore, I ask the BCB student body not to get accustomed to the idea of this imprisonment or forget about it. We need to keep ourselves updated on the news and stay engaged with the case, helping in what ways we can.